Happy Thanksgiving!!! Today I am thankful for many things .... and one of them is that the new websites for Mad Chicken Studio (a Duluth wedding photographer) have launched!!! I loved working with Jes of Mad Chicken Studio for many reasons ... obviously, the former wedding blog editor in me was OBSESSED with her imagery (I mean, wow!!!) but it was working with Jes that really made this job a joy ... she is AWESOME!!!! She, like me, understands the importance of having more than one domain for your company website ... and so we played with them a bit! Jes was the winner of my free website design giveaway and then she hired me to design 2 additional websites for her. We used 3 awesome domains and created 3 websites that focused on 3 wedding photography styles that Mad Chicken Studio offers! 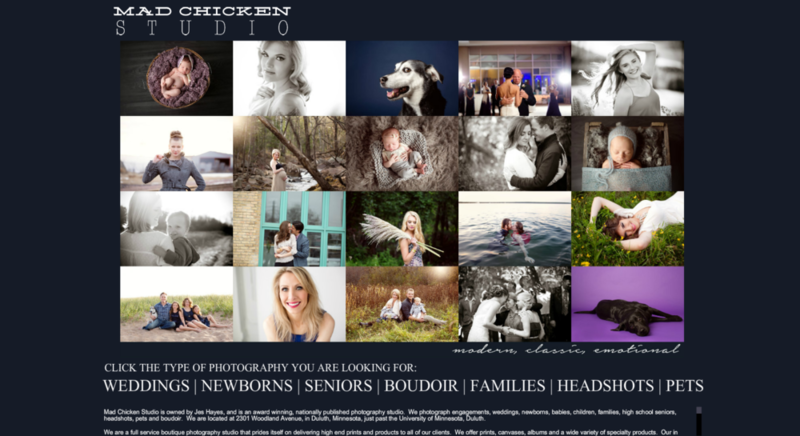 I designed one for Duluth Wedding Photography, Duluth Newborn and Family Portraits, and Duluth Senior Portrait Sessions! One of the many things I brought to the table while helping Jes with making decisions for her new website is that I am a mom with kids ... so helping design her family portrait website was a lot of fun for me ... I also really love her blog layout on the wedding focused website ... we decided to have a gallery with wedding portraits only and then focused on 6 individual weddings as well because Jes is AMAZING at capturing the emotion and I wanted to paint that picture for potential clients who come to her website. All in all I am SUPER excited!!! Congrats, Jes!!!! Here is a link to view Mad Chicken Studio! Party Pieces by Perry Website Gorgeousness!! Launched! !